Simon Lambert was so disappointed with his Scunthorpe showing. Reserve star Simon Lambert admits he was left speechless as Panthers lost their unbeaten Premier League away record. The city side threw away an eight-point advantage in the final three races of a 47-43 reverse at basement boys Scunthorpe last Friday night. Lambert was on the receiving end of one of the three successive 5-1s which left the club’s riders and bosses shell-shocked. He admitted: “We were absolutely gutted to lose the meeting and our unbeaten record on the road. “I didn’t speak to anyone afterwards. It hurt us a lot and it should never have happened from the position we were in. “We had done the hard part of get ourselves in front and we should have been able to see it out from eight points up with three races to go. “It was my second-worst meeting of the year and, while it was disappointing at the time, it highlights how well I’ve been riding. “This time last year I would have been over the moon with five points, but now I feel as though I have let the team down. I know I’ve bailed us out a few times though and helped us win meetings with my scores. Promoter Ged Rathbone remains convinced Panthers are getting a raw deal from referees. He felt a number of calls from official Mick Bates went against his side at Scunthorpe with home reserve Ben Wilson twice fortunate not to be excluded. 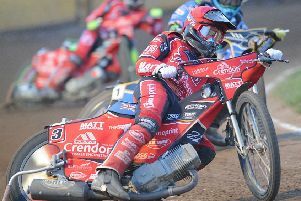 There were also claims of unfair riding against home rider Thomas Jorgensen in heat 13 when Panthers guest Rohan Tungate saw his race wrecked after being barged towards the fence. Jorgensen also aggressively passed skipper Ulrich Ostergaard. Rathbone said: “I’ve felt for a while that we aren’t getting decisions from referees and it is now costing us. “We went out of the KO Cup on a night when several things went against us and I felt it cost us league points at Scunthorpe. “It is not sour grapes from me just because we have been beaten. I just want the rules to be applied fairly and consistently.